"814. Glen Iris Park. Entrance"
"N.Y. Scenery, Portage & Vicinity"
This stereoview shows the gates designed by Letchworth's landscaper, William Webster. 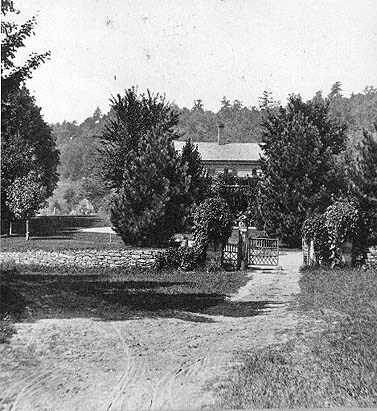 (see Ornamental Farm) The open gate leads to the Glen Iris, partially hidden in trees and ivy. The road to the left leads down to the Middle Falls area. Note the young maples in front of the Glen Iris. There are still a few of the Letchworth's original plantings left near the Glen Iris. For a later view of this location, see image 200.